A woman has emerged from a portable toilet after being locked inside for 48 hours for charity. 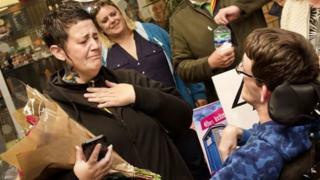 Louisa Marnoch, 47, was greeted by well-wishers as she left the cubicle in the lobby of Tesco in Milton, Cambridgeshire, on Saturday evening. She raised about £5,000, taking a fund to buy a wheelchair for local man Thomas Grice over its £25,000 target. "I don't usually get that kind of reception when I leave the toilet - and I'm glad of that," she said. During her time inside the toilet, she lived on sandwiches, cereal bars, crisps and chocolate. She slept in a sleeping bag and fortunately, when nature called, facilities were at hand. "I only managed a couple of hours sleep on the first night and three or four on the second night," she said. "Because it's a 24-hour store, there were always people about, and there was building work and a lot of drilling going on. "People would also bang on the side of the toilet to check there was someone inside." She spent her time blogging about her experiences and talking to friends on her phone. She said a high point - and low point - was getting a message from her daughter Oakley, 19, who is currently volunteering in a remote area of Tanzania. "She told me how proud she was of me, which was both happy and sad because I do miss her," she said. Mr Grice, 21, who has cerebral palsy, was among the people waiting to greet her when she emerged from the toilet. He is a student at Cambridge Regional College, where Mrs Marnoch is is a special educational needs and disabilities facilitator. Mrs Marnoch said she hoped he would get his new wheelchair within the next month.